Hello again! I am back with another make-up review for you all, and this time we will focus on a cleansing product. Remember: Cleansing your skin day and night is just as crucial for beautiful looking skin as any make-up product! 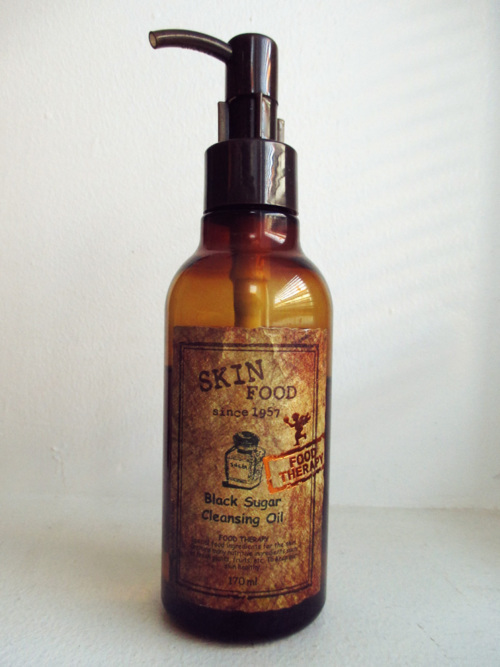 The Skin Food Black Sugar range of cleansing and skin products is based around providing moisture and gentle exfoliation using black sugar from Brazil. As you can see, the oil comes in a rather large bottle, with a nice pump. It also has a great little thing to put on the pump when you’re not using it, to prevent it being able to be pushed down accidentally. This makes it perfect for travelling, as it doesn’t risk spilling in your suitcase. The first thing I noticed about this entire range is the smell. The cleansing oil and scrub both have a fresh scent of lemon and feels very nice to put on your face. I usually am a bit squeamish about too strong scents in my skin products, especially for my face, but this one is just fresh and pure, not artificial and too sweet. As most other cleansing oils, this one is used by taking a small amount, about a pump or two, and gently massaging it onto dry skin. I like to take a good 3-5 minutes, properly working it into my skin and making sure I get rid of all that sebum and dirt clogging my pores. For the most part I really like this cleanser. Where some oil based cleansers tend to make my skin feel very oily and greasy, even after washing it off, this one comes off easily and my skin feels soft and refreshed after use. The only issue I would have with it, is that it is a bit less effective in removing waterproof mascara and eyeliner. However I find that most cleansers I use will have slight issues with that, unless it’s a really bad waterproof product. As a result I have made a habit of removing my eye make-up before cleansing the rest of my skin. As this is a oil, and it is generally designed to dissolve the make-up and not entirely remove it, I would recommend going over with a wipe or a cream cleanser again after removing the most resilient bits with the oil, just to make sure you get any residue left over on your skin. All in all, I recommend this product for anyone looking for a nice gentle cleanser, but I urge you to also look into the other products in the range, as they do work better together. I’ll be doing a review of the Black Sugar Scrub Foam next time, so stay tuned! A good cleanser for those just looking for a nice gentle make-up remover - but more effective with the other products in the same range.